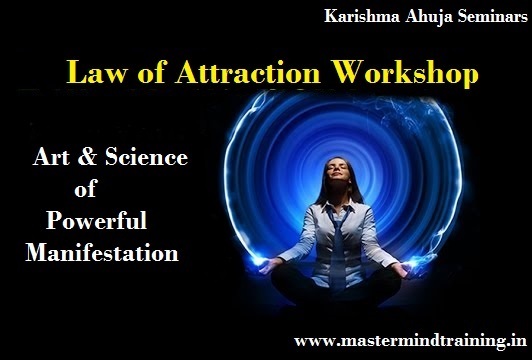 LAW OF ATTRACTION WORKSHOP - SAT 4TH MARCH 9 AM TO 6 PM, MUMBAI : Align yourself with what you wish to create in your life! Therefore, when we start becoming Conscious of our Point of attraction and practicing higher Vibrations, we can start using this law to manifest our dreams and attract what we want! • Easy & effective ways to stay connected with your Subconscious mind throughout the day. • Recognizing and eliminating the type of intentions that may be the reason why our goals haven't been met! • Money Tools: Raising your wealth consciousness to attract MONEY & prosperity. • Understand Quantum Mechanics: Scientific explanation of how the Law of Attraction works while you are awake and asleep & how we can consciously create our own reality!